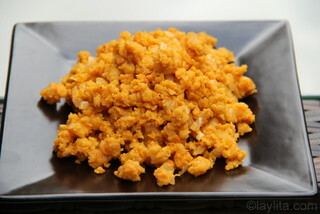 Majado de verde, also called just majado o majao, is a dish made by boiling green plantains, mashing them and then mixing them with refrito or sofrito of onions, garlic and achiote or annatto. 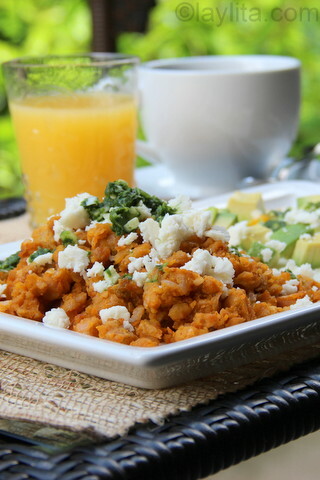 Majado de verde, translates literally as mashed green plantains, is very popular breakfast and brunch dish; though I love it for lunch or even dinner. 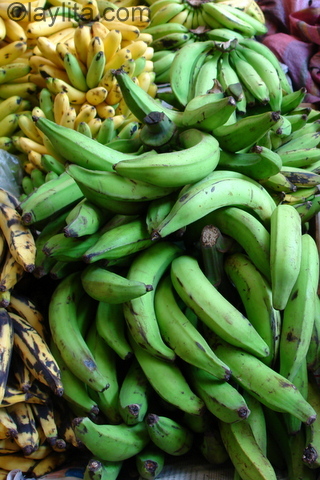 It is more common to find this majado or green plantain mash in the coastal areas of Ecuador; but it is also popular in the Highlands or Sierra. 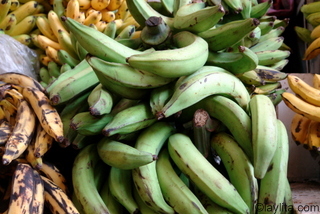 While majado is usually made with green plantains, it can also be made with green bananas. 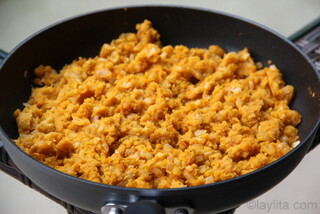 Majado de verde is a green plantain mash made with green plantains, onions, garlic, and achiote. 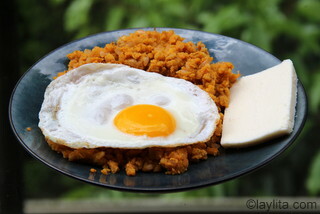 Majado is served with fried eggs and cheese slices. 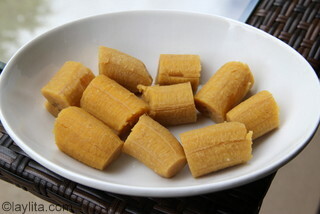 Boil the plantains for 30 minutes or until soft. 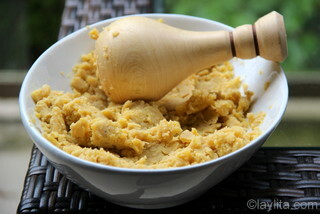 Mash the plantains using a fork or potato masher. The consistency should have some small chunks, if it’s too smooth it will stick together. 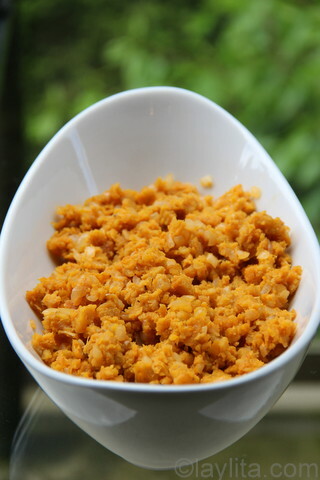 Prepare a refrito by heating the butter or oil over medium low heat, add the diced onion, crushed garlic, achiote or annatto, salt and pepper. 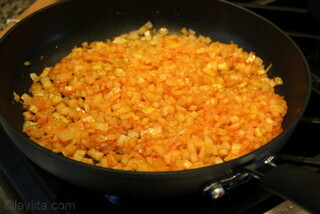 Cook until the onions are soft and translucent, about 7-10 minutes. 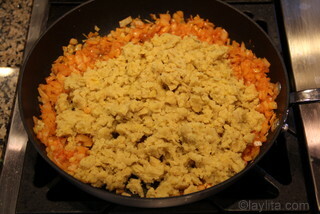 Add the mashed plantains to the refrito and cook for 10-12 minutes, stirring occasionally. Taste and add additional salt/pepper if needed. 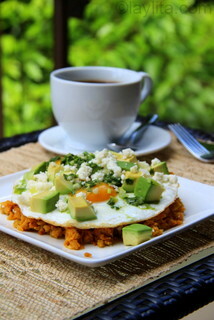 Serve immediately with a fried egg, slices of fresh cheese, avocado slices and aji criollo. When I was growing up in Vilcabamba, the community of foreigners was still small enough so that everyone knew each other. Now it has grown so much that this is no longer case. Back in the old days, one of my parent’s good friend and neighbor – by neighbor I mean several km away – was Jaime, originally from Guayaquil, but who had lived in the US. He came to Vilcabamba to manage the Parador (the first hotel in town). After that, together with his wife, Durga, they started another hotel/hostal called Madre Tierra. I have great memories of Madre Tierra and Jaime’s family, both happy and sad. The happy ones include fun times with friends and family; and of course, some delicious food memories, especially breakfast memories. They made amazing bread, baked in a clay oven. The homemade granola and yogurt were also delicious. My personal favorite was the majado de verde that Jaime made. I always tend to associate food with specific memories and this majado de verde dish reminds me of Jaime. Sadly, Jaime passed away recently, and sold Madre Tierra several years before. I recently rode past Madre Tierra while on a horse ride, but haven’t been there since the days when it was still Jaime’s. 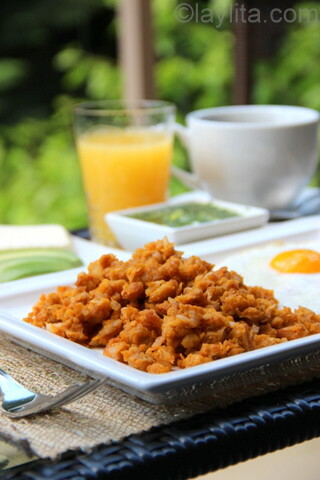 There are a few different dishes that are similar to this one that are made with green plantains. 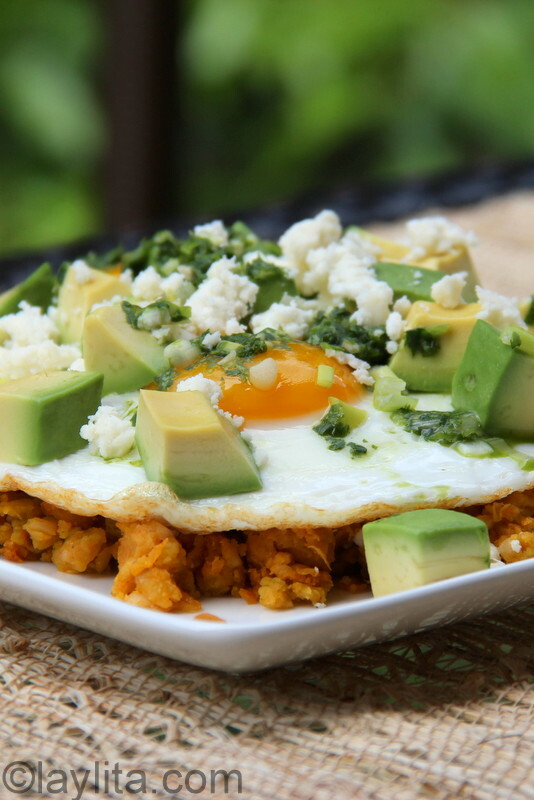 Molloco de verde is a very similar dish, the main difference is that eggs and cheese are added directly when cooking the mashed plantains with the refrito. 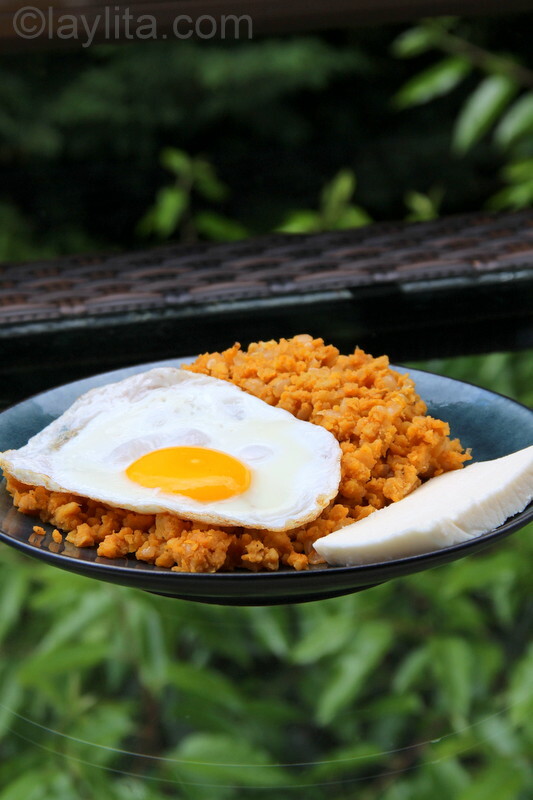 Tigrillo is green plantain mash that has a more moist consistency due to the fact that it also includes milk and cheese – my favorite variation of tigrillo is one that adds shrimp. You can also fry the green plantains, mash and and stuff them with cheese or meat to make bolones de verde or green plantain dumplings – another delicious plantain breakfast dish. Majado de verde is also very similar to some popular Caribbean plantain dishes, including the well-known mangu from the Dominican Republic. There are also similar variations known as mofongo in Puerto Rico and fufu de platano in Cuba. 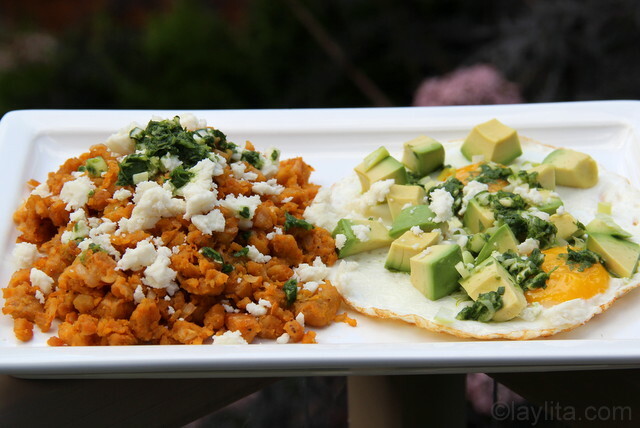 Majado de verde is usually served with a fried egg and a slice of queso fresco. I also like to add some diced avocado or avocado slices, as well as some freshly made aji criollo or hot sauce. 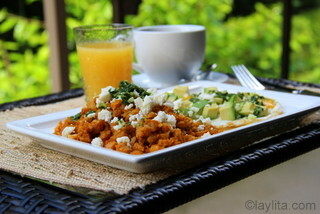 As a breakfast dish, black coffee and fresh fruit juice are also a must. The quantities in this recipe are for 4 people. Thank you so much for your website. I am learning ecuadorian recipes and this is the first recipes I tried and we love it. I am buying lots of ecuadorian things like machica, harina de achira, harina de maiz, harina de platano…wow there are so many things. Thanks a lot! It’s funny, I came across your site looking for a recipe for bolones de verde. The last time I made them was over 20 years ago as a boy with a friend of my mothers in a little town called Vilcabamba a hostal called Madre Tierra. If memory serves we baked them before mashing but that was an awful long time ago. It delights me to see some of these recipes and brings back lots of wonderful memories, thank you. It’s absolutely delicious ! I didn’t have achiote so I replaced it with chili powder. The second time I cooked it I added a jalapeño and ate it with a rest of beef empanada filling, I also tried it with pulled pork carnitas. It works every time :D Thank you ! Greetings from a North American expat living in Cuenca! My neighbor kindly brought over a bunch of green plantains the other day and said she likes them best made into tigrillo. Of course I headed straight for your site, certain that I would find detailed instructions and I did! I followed the above receipe, adding a little milk and cheese to the mash and produced a delicious and VERY filling breakfast. I brought a plate, served with fried egg on top and a side of guacamole, to my neighbor. Now she thinks I’m a talented cook. She’s an old-fashioned lady without a computer but I will share my secret with her anyway. Perhaps your website will lure her into the internet! Thanks for making me look good and for giving me the courage to cook the foods I enjoy in restaurants at home. Great recipe! I made it for a family brunch on “conference Sunday” (LDS general conference- great time to cook because no church meetings). I made tigrillo and layered strips of a thin omelet on top instead of the fried eggs. It was a hit with my whole family of gringos . Thanks for an always inspiring website. Laylita I love the pictures that you put with the recipes…as they help us to prepare the dishes. They act as visual aids! 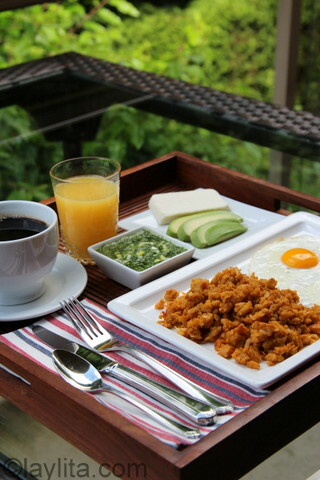 Thank you for making it simple to prepare these yummy Ecuadorian dishes. Merry Christmas and Happy New Year to you and your family! Peace! Thank you, Tony! Merry Christmas! This looks great, though I’m going to have to wait until I’m back in Colombia to get the green plantains, here in Brazil they are impossible to find (it’s weird, they only sell plantains maduro and I haven’t been able to get anyone to bring them in green) Can it really be made with green bananas? We’ve tried making patacones with green bananas and they turn out ok, but not the same. 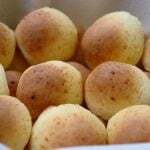 Hi Layla, I found your blog last week while looking for some Pao de Queijo’s recipe. I love it and bookmarked it as one of my favorite blogs. !Congratulations, thank you so much for this beautiful blog! 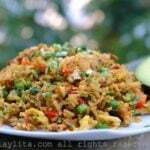 Regarding this recipe of Majado Verde is similar to the “Mofongo”, as you have already said. 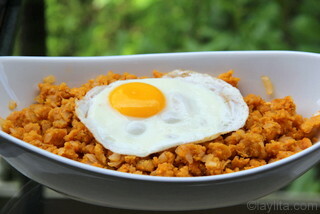 This is a very popular dish in Puerto Rico and Dominican Republic. I’m from Dominican Republic and here we make the “Mangu” a mashed green plantains we usually eat for breakfast or dinner with a sort of side dishes but the recipe is quite different. After boiling the plantains we mashes them completely until smooth, adding some of the water where the plantains boiled and some cooking oil, butter or olive oil. To serve the dish we make an onion refrito (Julienne onions, vinegar and salt). 1) Add 2 or 3 spoon of cold water to keep soft the mangu. 2) If you use an aluminum pot to boil the plantains add some drops of lemon juice to the water before boiling the plantains. This will keep your aluminum pot clean and without spots. 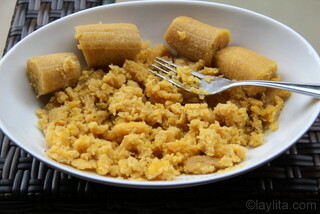 We dominicans eat mashed plantains too, we call it mangú. But this way of eating green plantains really intrigues me. I will definitely give this a try. Made it this weekend and it was awesome (and soooo easy)! 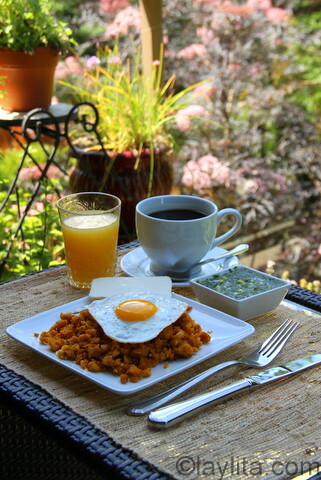 Accompanied con cafecito, it was the perfect breakfast. I added finely chopped chicharon and pork fat that I bought at the Mexican market (Fiesta) here in Dallas, that’s what my mom uses when she makes bolones de verde. OMG, Laylita!!!! My american husband LOVES this dish! I know that he is dying for Majado whenever he shows up home with green plantains from the store :) I was born in Quito but my mom is from Guayaquil. I remember her making majado quite often for breakfast (mmmm, majado and black coffee is something out of this world!!). 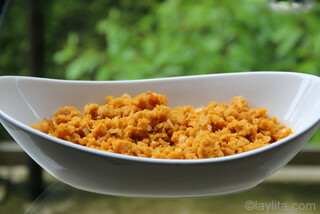 She used to use mapahuira (a mixture of lard and little bits of pork) for her refrito instead of butter. Sadly for me, it’s impossible to find mapahuira in the US, but I’ve learned that bacon makes a WONDERFUL substitute!! YUM!!! I’ve never tried mixing cheese with my majado, but I imagine it must taste the same as bolones, DOUBLE YUM!! I need to try your recipe soon … Thanks again for your wonderful recipes!!!! I love mangu and mofongo. I know I’ll love this majado de verde recipe. Thank you! My esposo and I enjoyed a plate of mofongo last weekend in a Puerto Rican restaurant. He was trying to explain to me a dish he had in the Ecuadorian Oriente many years ago that was somewhat similar to the mofongo. I will make this and see if this is what was on his mind. Thanks Laylita!